As Plantronics' recent study proves, noise at work is also a growing issue. Open plan offices with little acoustic planning often amplify noise. Outdoors, everyday noise can make it just as difficult to hear and be heard. 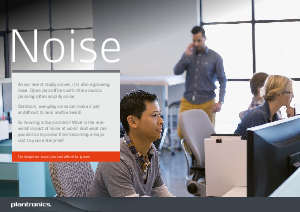 This white paper will help you understand the real-world impact of noise at work. Download now to discover how to stop noise from becoming a major cost to you enterprise.